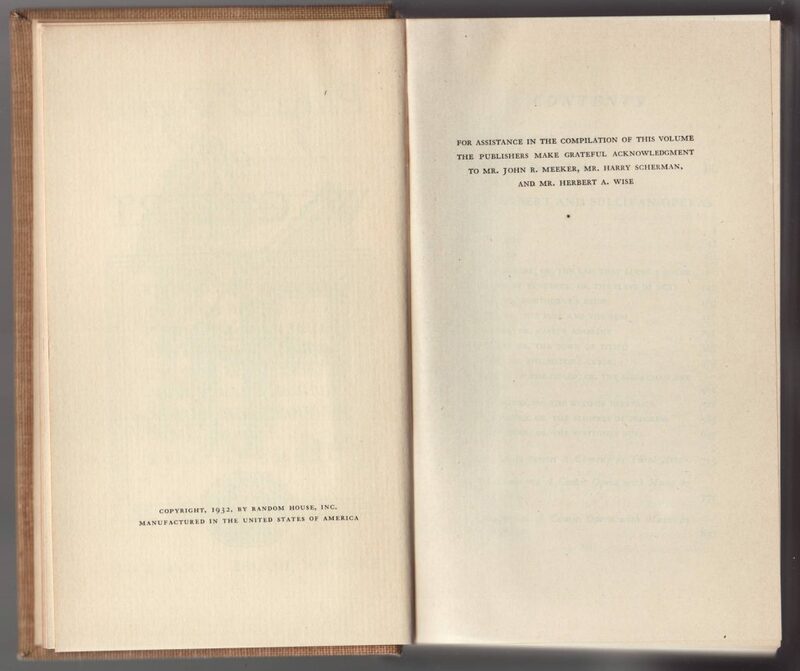 In 1926 the Nonesuch Press formed an agreement with Bennett Cerf, of the Modern Library (and, in 1927, Random House), to distribute Nonesuch titles in the US. For Cerf, the high-quality Nonesuch books, particularly those issued in limited editions, were a means to boost the image of his firm, founded upon the inexpensive Modern Library series Cerf purchased from Boni & Liveright in 1925. The relationship with Cerf and the Modern Library were fortuitous for Nonesuch, as it provided a means of distributing Nonesuch books (in the network already established to distribute the Modern Library) and, eventually, funds that helped defray the costs of editing and producing new Nonesuch titles. 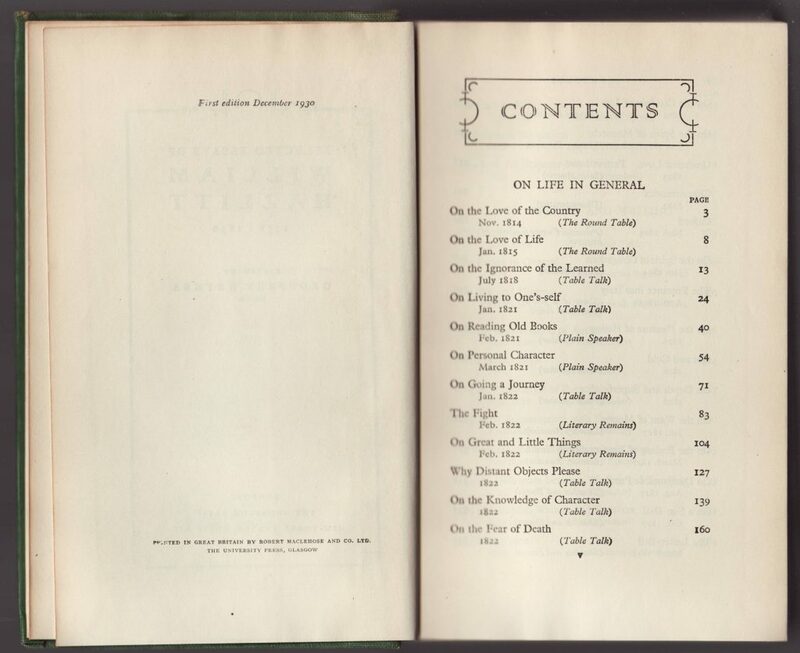 The Nonesuch Library consists of a series of 15 single volume editions compiling key literary works of major writers and poets published beginning in 1927. These titles were part of the publisher’s “unlimited” (as opposed to limited edition) publications. While cheaper and less extravagant, the unlimited titles published by Nonesuch had a very high quality of editing and production. Advertisement from 1934, calling the series the Nonesuch Compendious Series. The series began in 1927 with no formal series name on most of the books or jackets, but the name Compendious Series was used informally and begins to show up in advertisements for the series in the mid-1930s (above). 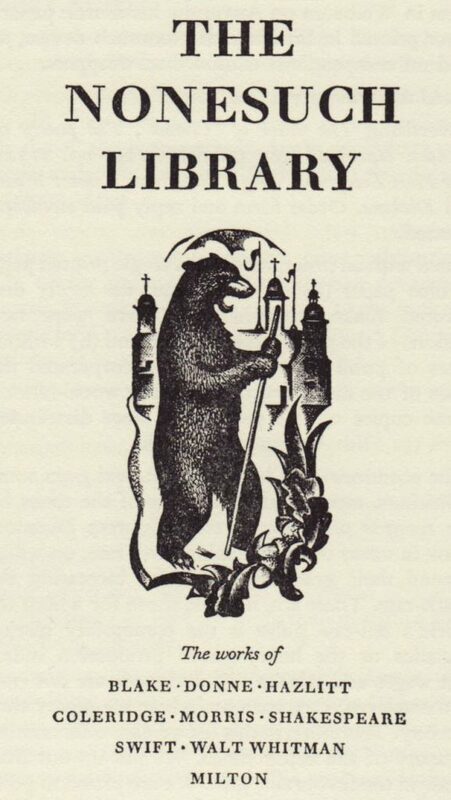 The Nonesuch Library series name was first used in a 1937 prospectus (below) and shows up in books and on jackets more consistently after 1952, when the Nonesuch Library, Ltd. is incorporated as a separate entity from the Nonesuch Press. 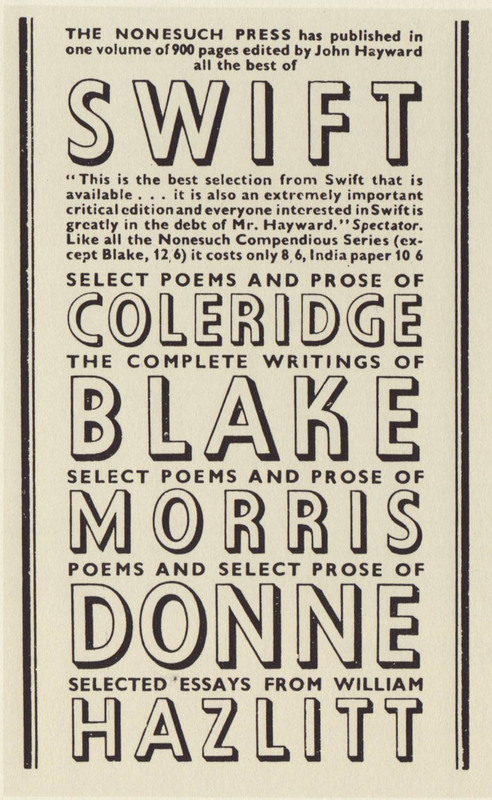 Advertisement in the 1937 prospectus of new Nonesuch Press titles. From this point forward, many of the books were labeled as in the Nonesuch Library series. The first book in the then unnamed series was The Poetry and Prose of Blake edited by Geoffrey Keynes. Issued in August of 1927, the book sold for 12s/6d (buckram) or 1 pound/1s (limp orange parchment) in the UK, and, correspondingly, $3.50 or $8.50 via Random House in the US. 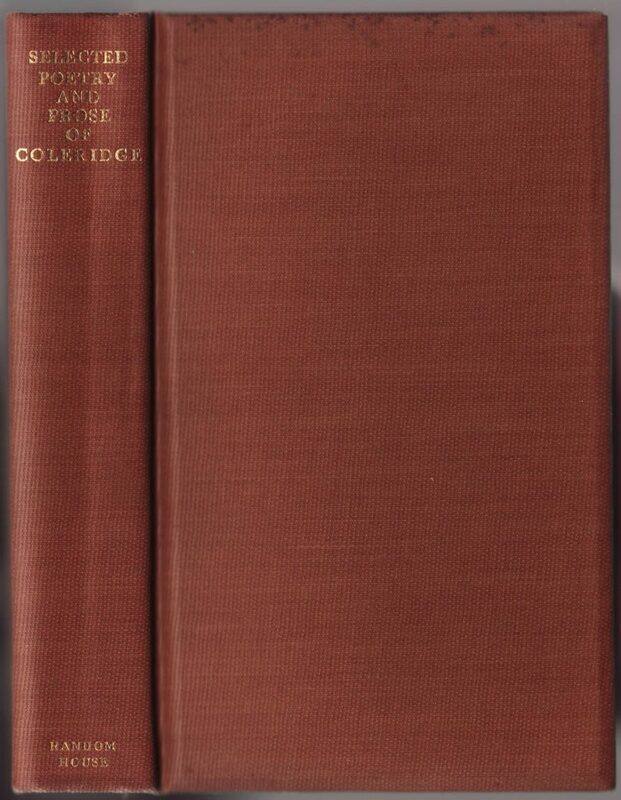 The Blake title was reprinted through 1975, revealing the staying power of these well-edited books. By the early 1930s, the depression was taking its toll on the Nonesuch Press and Meynell began to search for a buyer for the firm. Random House was interested but found itself unable to raise the cash in the depths of the depression. All were originally published in the Modern Library or with a Random House imprint. In 1952 Meynell purchased Nonesuch from Macy and established The Nonesuch Library, Ltd. to develop and market Nonesuch Library (formerly Compendious Series) books. Again, Random House continued to market the Nonesuch Library titles in the US. Some of the books were not reprinted, but many were reissued many times through the mid-1970s. In in 2005 Peter Mayer, former CEO of Penguin Books, purchased the Nonesuch Press and began reissuing some of its titles, including a few Nonesuch Library titles, through his Duckworth and Overlook Press imprints. A list of titles in the Nonesuch Library below includes the original date of publication and, if available, the number of reprints of the title and the last reprint date. This information is from John Dreyfus, A History of the Nonesuch Press (London: The Nonesuch Press, 1981). 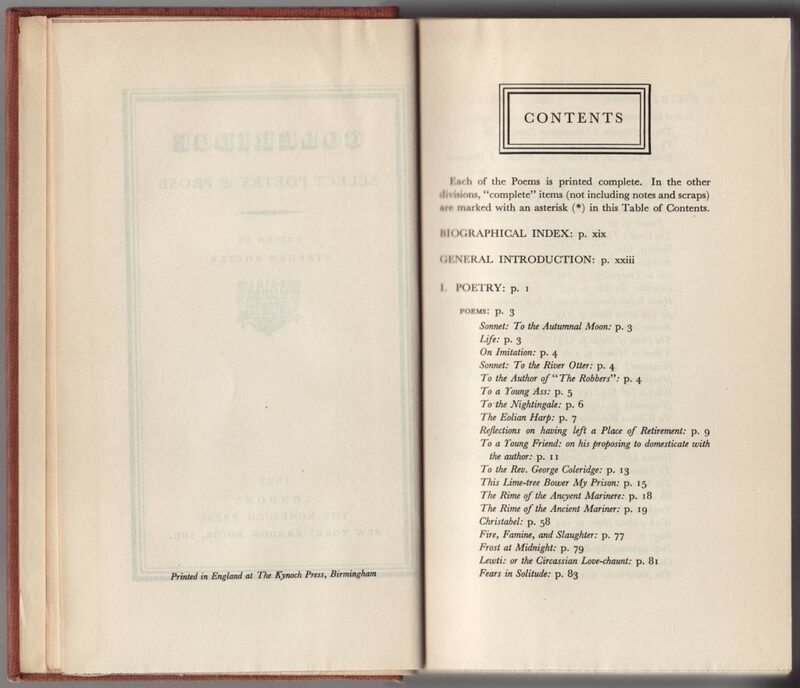 The 15 titles in the unnamed / Compendious / Nonesuch Library series are difficult to sort out bibliographically for several reasons: the earlier books were printed in the UK and some copies (starting 1926) were shipped to the US where they were bound and jacketed by Random House. Later, it seems that Random House printed some of the books themselves. Some of these may have been sold in the UK as well as the US. The jacket designs (like the series name) are not consistent and special jackets (say for the centenary of an author’s birth date) may have been used on particular printings of a title. Book titles also varied from book to jacket in some cases. Thus we have a series with varying names, printed in the UK and sold in the UK and the US, or printed in the US and sold in the US (and maybe the UK for specific titles) often with multiple dates and in inconsistent bindings and jacket designs with varying titles for the same book in some cases. For a fancy press, Nonesuch was not very consistent with this series. 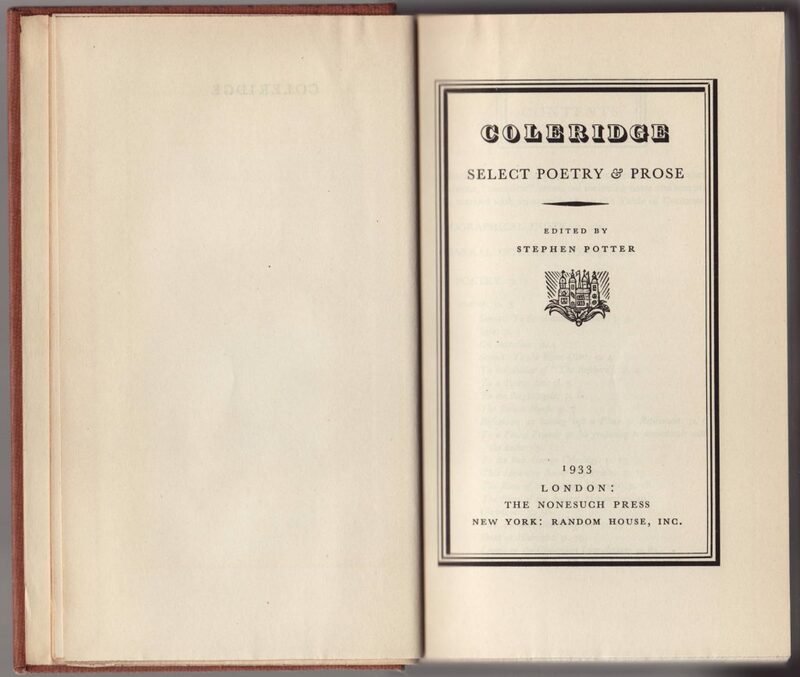 This 1933 copy of Coleridge’s poetry and prose suffers from various titles depending on where you look on the jacket or in the book. 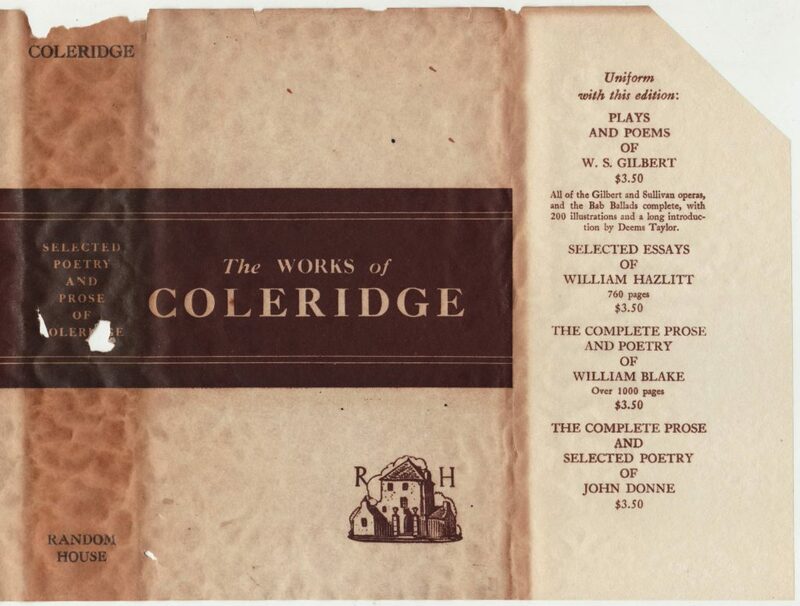 The front of the jacket indicates The Works of Coleridge, the jacket spine Selected Poetry and Prose of Coleridge, the title page Coleridge: Select Poetry & Prose. 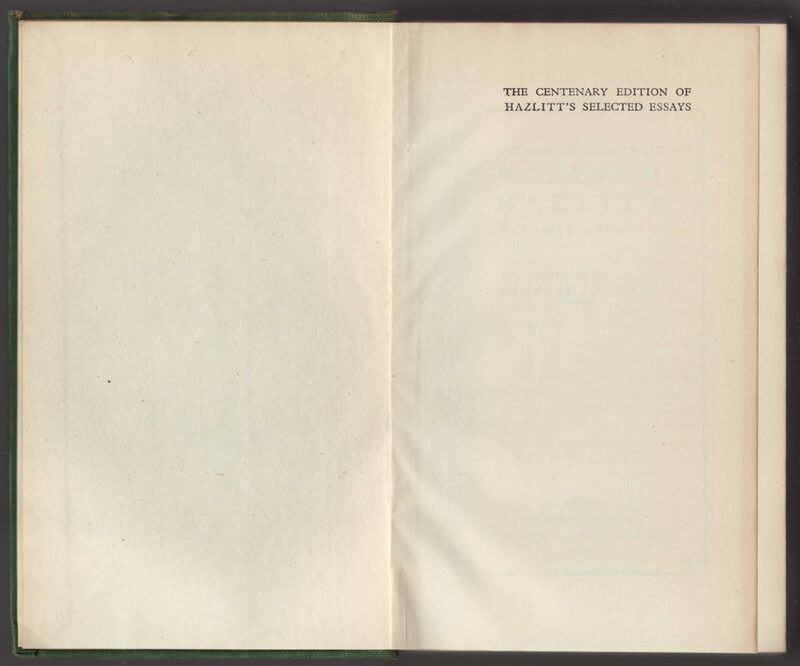 This book is part of the first issue of titles in the Compendious / Nonesuch Library consisting of sheets printed in the UK and bound and sold in the US by Random House. There is no series name indicated on the jacket or book. The US jacket designs are common to the series and are relatively simple, printed on parchment. At least one additional jacket design was used after this one by Random House for copies of the series sold in the US. 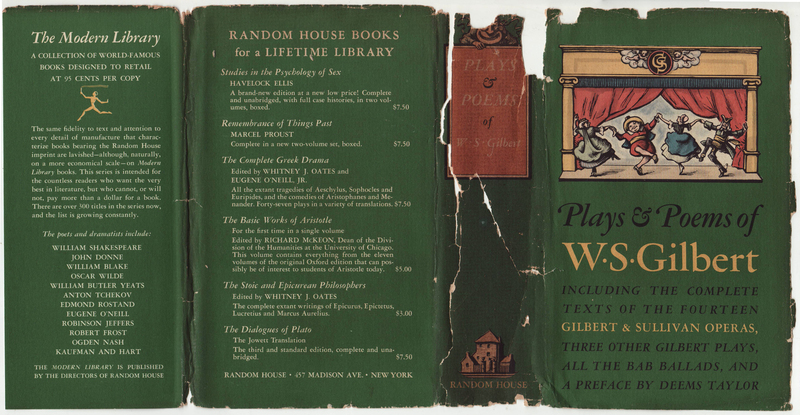 The Random House colophon is included on the front of the jacket, and four additional titles, “Uniform with this edition,” are listed on the front jacket flap. All are priced at $3.50. Contrast this with the .95 cent price of Random House’s Modern Library series titles at the time. The Gilbert title was not in the UK Compendious / Nonesuch Library series but it was formatted and designed like them (see below). Random House would later supply a few titles (De Quincey, Jonson, Carroll and Pushkin) which would be included in the series. The brown band continues from the front of the jacket to the back, but there is no printing on the rear of the jacket or back flap. 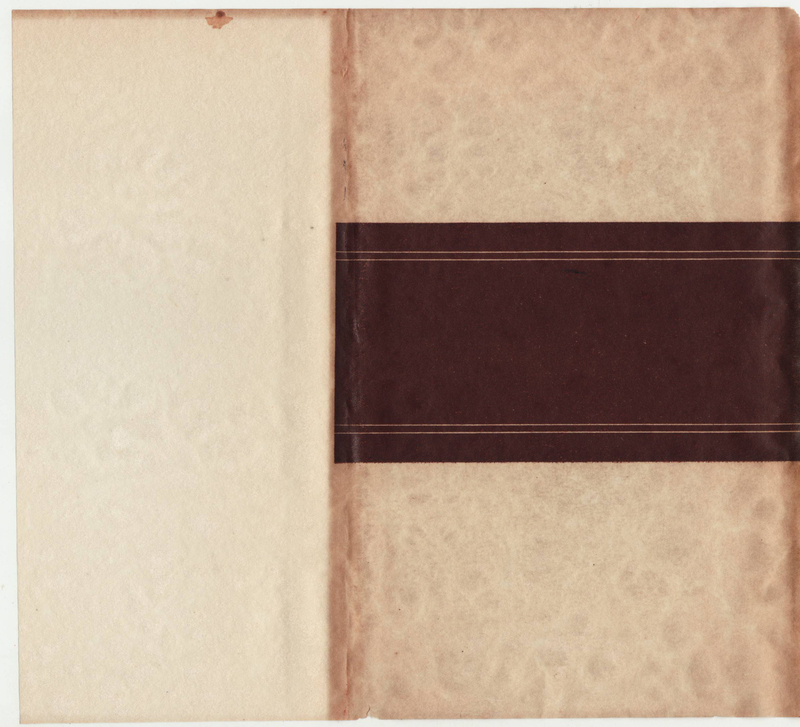 The books are bound in plain but very hefty brown buckram, a solid library binding. The buckram resembles that used by Random House to bind some of the Modern Library titles from the 1930s-1960s (issued without jackets, primarily for libraries). 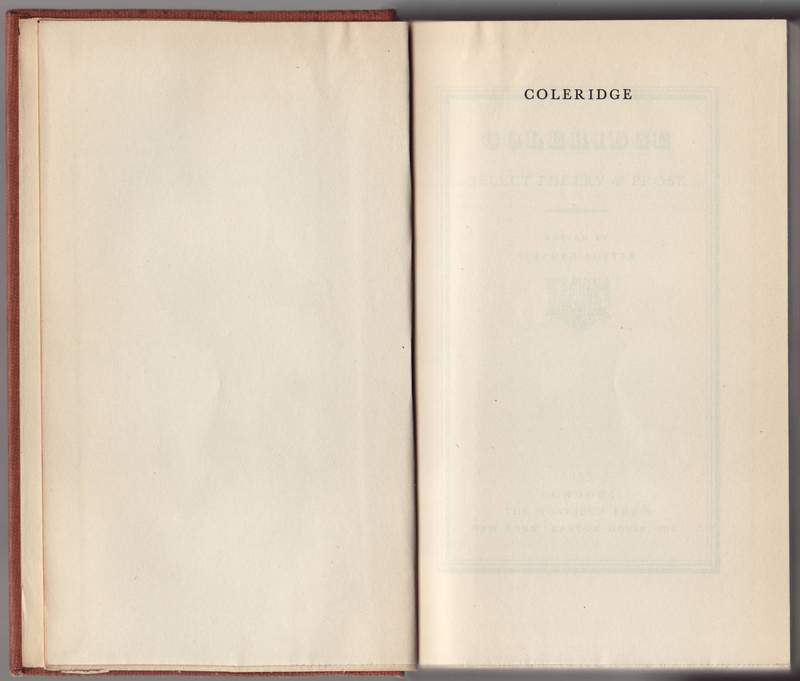 The title page with the 1933 date and the Nonesuch Press / Random House imprint. The Nonesuch colophon is centered on the title page. The book was printed by the Kynoch Press, in Birmingham, UK. The sheets were shipped to the US where Random House bound and jacketed the books for sale in the U.S. 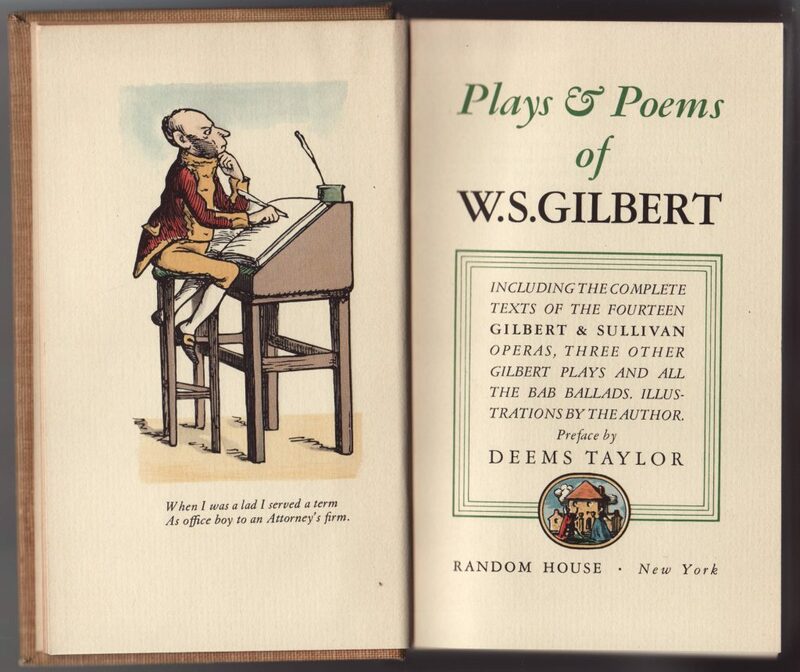 While not officially part of the unnamed / Compendious / Nonesuch Library series, The Plays and Poems of W.S. 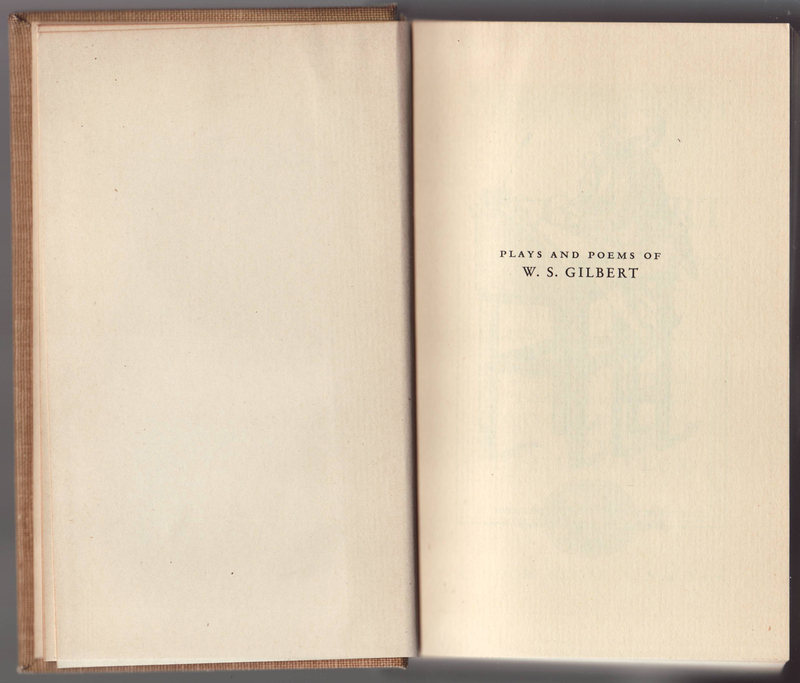 Gilbert was advertised with that series and the book, at least, was of similar size and design. The jacket, below (missing its front flap) advertised other Random House titles including the Modern Library. 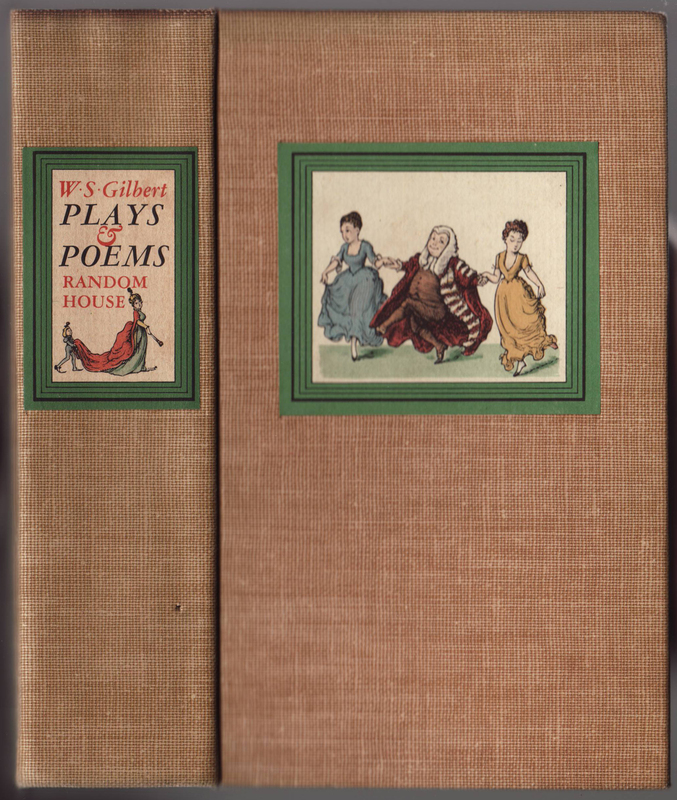 Buckram bindings, like the other unnamed / Compendious / Nonesuch Library series titles sold by Random House in the US, included glued on spine and front cover decorations. 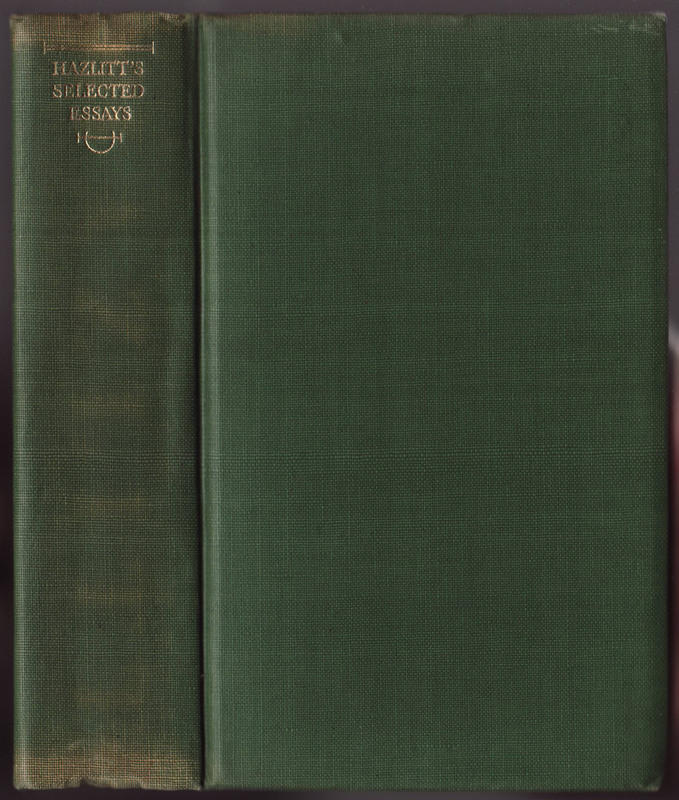 The copy of Hazlitt’s Selected Essays below is dated both 1930 (the original date of publication) and 1947 (the reprint date of this book). This jacket became the default in 1937 on UK and US jackets, but it seems that Random House issued at least some titles with a variant jacket design after this date. There were at least two older jacket designs used on US (Random House) titles, and I have yet to see a copy of a pre-1937 UK edition (without the jacket design below). The post-1937 jacket uses a stylized illustration of the Nonesuch palace, common to the series. Jacket colors include green, black, red, brown, blue, and maroon. This copy includes the series name on the front of the jacket. This became common after 1937, but may not be found on every jacket. The front jacket flap contains a prospectus for the series and a 15s price, indicating that this is most likely a copy sold in the US. 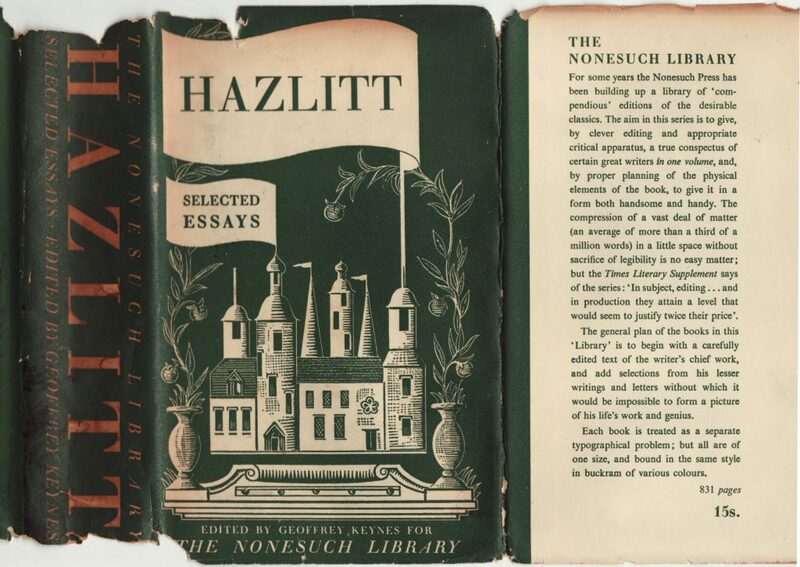 The rear of the jacket describes the Hazlitt title in detail. 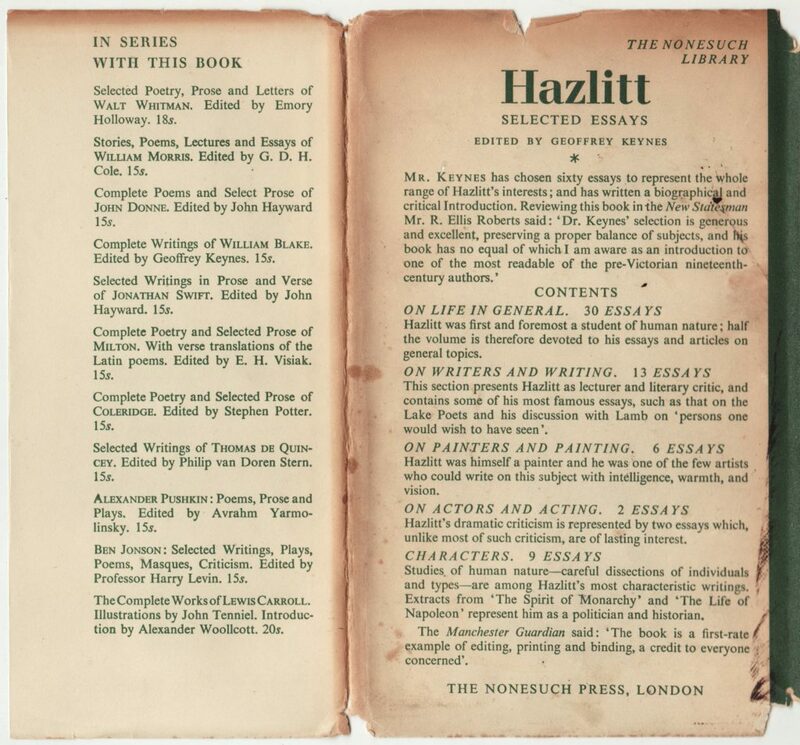 The rear flap lists eleven titles available (not including Hazlitt) at the time. Missing are the Shakespeare Anthology and the as yet unpublished Byron and Shelly titles. 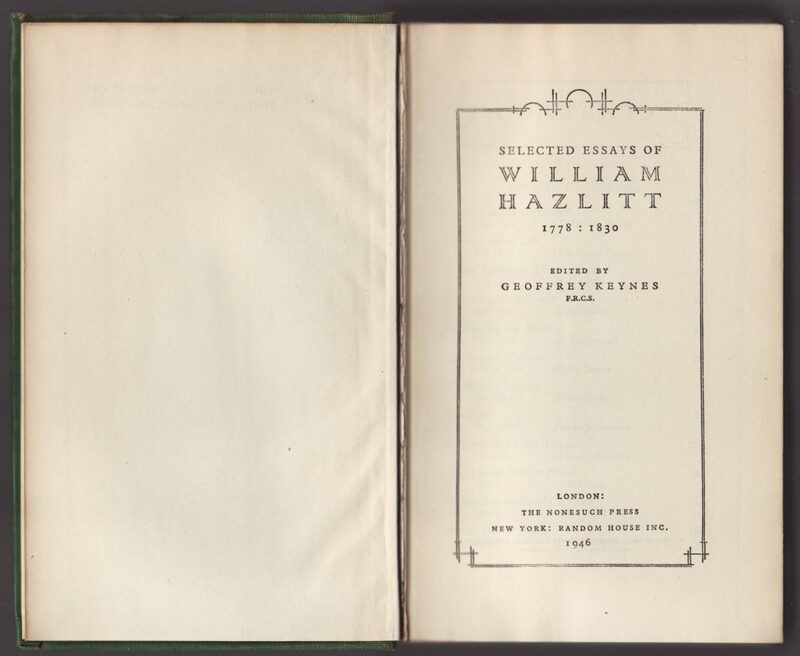 The half title page provides an alternative title for the book: “The Centenary Edition of Hazlitt’s Selected Essays” which was the title used when this book was first issued in 1930. The title page with the Nonesuch and Random House imprints, and the date of 1946. 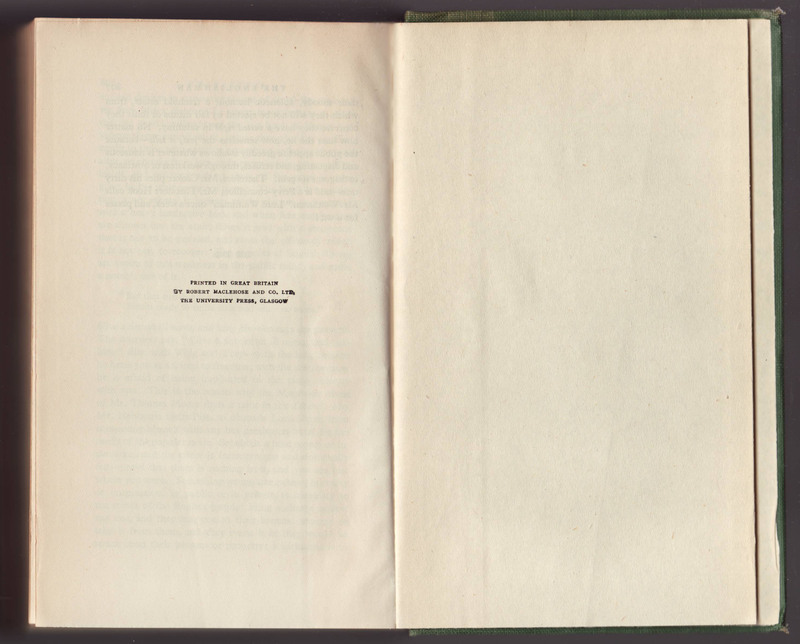 The copyright page indicates “First Edition December 1930” – maintained from the first printing (although this copy was printed in 1946). The book was printed in Glasgow by Robert Maclehose & Co., as per the indication at the bottom of the copyright page. The Maclehose printing indication is also found on the last page in the book.